Finally, I can set a date for the Trial of the Crusader’s Beta where I can dedicate all my time to those players who are going to participate – which is the Friday, October 2nd. So, as I expect, if no major issues appear during the testing, Trial of the Crusader’s official release would be the weekend after. We have received some suggestions as for the Beta, and based on my previous experiences I would say they are right. This time the time to access will be limited and there shall be a list with some specific tasks to do when testing. So, I would suggest you stay organised and focused on such tasks. The Beta testers are invited to help us to check those things on a real player raid environment that can not be checked properly while the content is still being developed, in order to to deploy the encounters to the live server as polished as possible. The instructions and details about how to connect and how to proceed are going to be sent via e-mail to each group or guild. There will be also an e-mail group, like Ulduar one, so we can be in constant communication altogether, even outside the game. I will be updating with the corrections if there is something to be correct, as well as with other relevant things. 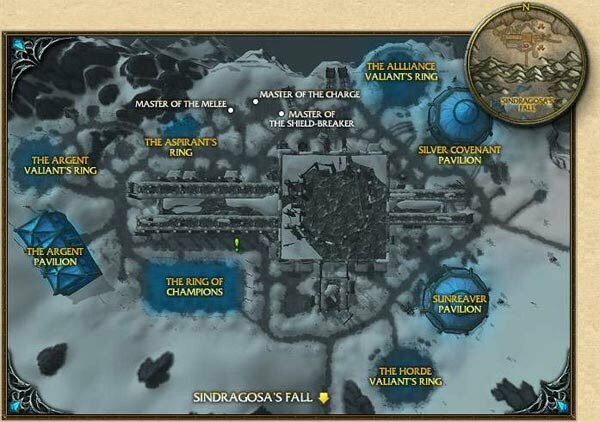 Remember, the next content patch’s release shall include Trial of the Crusader raid (every mode and difficulty), the new 5 man dungeon (both modes), Koralon from Vault of Archavon along with the new tier set, vendors, emblems and the start of the new PvP Season. Onyxia’s Lair shall be released a bit later, most likely between 1 and 2 months after the ToC’s official opening, with all that it implies – the remaining parts of the legendary chain quest. Since it will be an extraordinary event, we will announce it with time enough so the players can prepare themselves and compete for the legendary mount. The duration of this patch will be much shorter than the previous tiers, being Icecrown Citadel and its dungeons released in few months. There shall be another Beta test for Onyxia’s Lair, the requirements to assist are still pending to be decided. I would like to give you a small update regarding the current progression point and situation. As many of you are aware, we have had to attend to several unexpected issues over the last few months, which has, of course, slowed my work on the new content release quite considerably. I can imagine some of you have noticed these disturbances and that my attention was required. Nonetheless, I am quite pleased with the state of TOC and I think it is ready for a good session of beta testing. I would like to open the PTR in 2-3 weeks, as I am currently finishing my work and trying to set a concrete timeframe for the Beta (until then, the beta testing date is not official). I need to have everything prepared, because once the Beta is open, I will need to be fully focused and ready to fix any issue that may crop up, as well as stay in constant contact with the Beta testers. The official release of TOC will be one week after the Beta is finished (if no major issue appears). There is also a topic I would like to mention, which is the last week’s server unstability – it has nothing to do with us, our host company has been experiencing some issues with their network sessions and many hosts have been affected randomly, for several days at a time. They are already aware of the issue and working on it so it should not persist. If it continues, however, we are going to move our realms to another host provider – the effects on player experience should be minimal. Anyways, there is a matter I believe has been managed poorly from my side, which is the lack of communication. Some players have mentioned it to me and they are indeed right. I should have kept the community more updated with current events – I would like to make an apology for that, I have been very overloaded, trying to manage many tasks at the same time and I may have underestimated the importance of keeping you, the players in the loop. From now on, communication is one of the things we are going to work on most and try keep our community properly updated. There have been some issues with the Tournament’s results and videos. I have sent an e-mail to every group leader and am currently awaiting response from some of them. Once we get all the required information we will distribute the points. We will try to at least partially compensate you for the delay and will add an extra reward to every tournament participant.